On Sale Now! 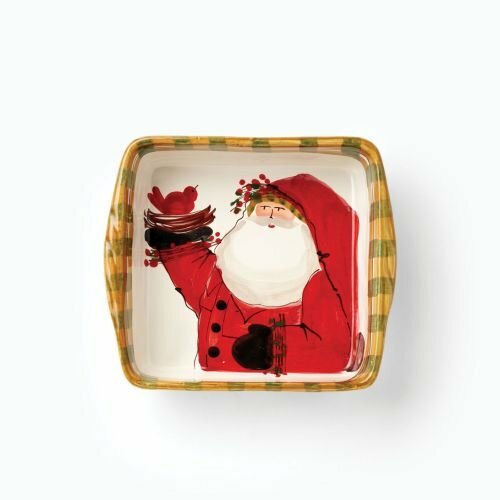 Save 4% on the Vietri Old St. Nick Square Santa Baking Dish - 10'' Square by VIETRI at Seasons Cafe Bakery. MPN: OSN-7862. Hurry! Limited time offer. Offer valid only while supplies last. OSN-7862 Features: Holiday Theme: -Yes. Seasonal Theme: -Yes. Holiday: -Christmas. Season: -Winter. Dimensions: Overall Product Weight: -4 lbs. OSN-7862 Features: Holiday Theme: -Yes. Seasonal Theme: -Yes. Holiday: -Christmas. Season: -Winter. Dimensions: Overall Product Weight: -4 lbs. Overall Width - Side to Side: -10". Overall Depth - Front to Back: -10". Hand Painted and Hand Made in Italy. The Old St. Nick Square Dish Measures 10" Square. The Old St. Nick Square Baking Dish features the hand painted design of maestro artisan Alessandro Taddei. Dishwasher safe - We recommend using a non-citrus, non-abrasive detergent on the air dry cycle. This Square Baking Dish is made of Terra Bianca Earthenware - VIETRI uses natural earthenware clay that is indigenous to Italy.